Drop by the library over the lunch hour Monday through Thursday, March 5-8, between 11 a.m. and 1 p.m, to help celebrate Open Education Week. 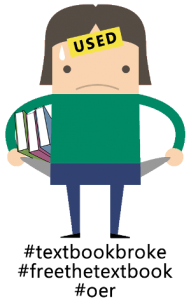 NMC faculty saved students $149,500 this semester by choosing free or low-cost textbooks. Come tell us about how the cost of textbooks affects you and get a #textbookbroke t-shirt! Cake on Thursday! Please join us in welcoming these new additions to our NMC staff!